You notice that your iPhone visual voice mailbox is not showing any voicemails, even though you know have voicemails when you dial your voice mailbox. In addition, you see a call voicemail button in your iPhone voicemail box. You may also see deleted voicemails and when you attempt to delete them, they re-appear. Perform the following steps to get your iPhone visual voicemail to re-appear. Swipe-up and quit phone app if you had voicemail open prior. Enable Airplane mode and wait a minute before disabling it. Check to see if visual voicemail is working again. Reset iPhone network settings. Go to Settings -> General -> Reset -> Reset Network Settings. This will reboot your iPhone. Once your iPhone is on, wait at least 15 minutes before checking visual voicemail again. If the above steps do not work, call your iPhone from another phone and leave a voicemail. Some users report visual voicemail works after leaving a new voicemail. After performing all the steps above, you may need to wait up to an hour before visual voicemail appears again. 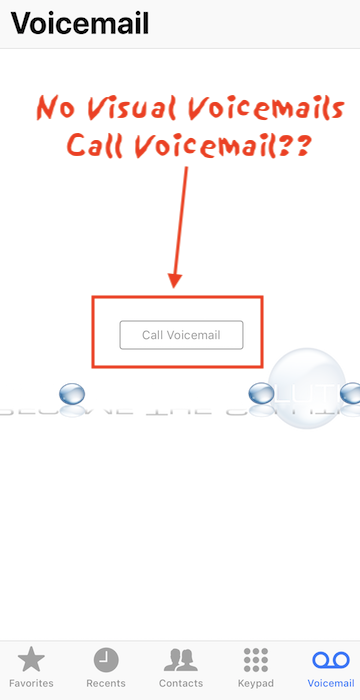 All else, contact your iPhone carrier to confirm visual voicemail is enabled.